Language read: First two books in spanish and paper, two last books in english in ebook. Aproximate size: Four enormous books: City of Golden Shadow, River of Blue Fire, Mountain of Black Glass, Sea of Silver Light. 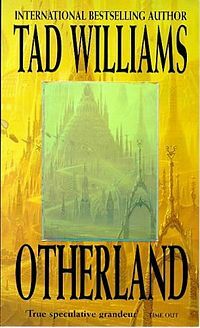 Impressive saga by fantasy/science fiction author Tad Williams (and with this one he has at least two now). Otherland is set in the near future. It tells the story of a fistful of people whose destiny gets entangled to that of a mysterious virtual reality extremely realistic. It is told form the point of view of the characters. Something to highlight is the great diversity to be found among the protagonists and antagonists: a female specialist in virtual reality from South Africa, a male bushman wishing to learn about virtual reality, a male Aboriginal Australian with mixed lineage, a blind French woman, a pair of american teens, several South Africans more, at least one male Hindu, a female Chinese, a male Japanese, several Roma… thanks to the net and the virtual realities, the big geographic distance can be ignored to put together a very eclectic group. The developing of the story is very interesting, setting up a lot of mysteries and solving all of them in a highly satisfactory way. All characters are treated with care and given great depths, even the most despicable antagonists. Tad Williams had already won me with Memory, Sorrow and Thorn. Now he is in my short list of writers whose works I want to read in full. As soon as I can I’ll get to Shadowmarch.